There’s no doubt about it, having children costs a lot of money. However, if possible, it’s a great idea to set up a savings account and/or investment fund for your child so they have a little nest egg. Children’s savings accounts and funds, although both tax free* vehicles for stashing away money for your child, differ tremendously in terms of accessibility and management. I have set up both. If you don’t want to lock money away for a long period and are simply looking for a place to put birthday money, Christmas money and the occasional spare fiver, whilst getting some interest, then a simple children’s savings account is the way to go. You open the account in your child’s name but manage it yourself until they’re old enough to do it themselves. Children’s accounts usually pay higher rates of interest; a quick look on a comparison website is the best starting point. You’ll be able to see who gives the highest rate of interest and if there are any conditions attached such as saving a minimum amount each month, not having instant access or tying up the money for a fixed term of say a year. Check the features of the account carefully and then rate according to your needs. A word of warning, money put into the account from a parent is only tax-free up to £100 interest, per parent each year. Above this and the lot’s taxed at the parent’s rate. It is in this scenario that a Junior cash ISA might be worth considering (more about that below). You may have heard of Child Trust Funds (CTFs). These were long-term, tax-free savings accounts for which the Government gave you a £250 voucher. I set up one for my eldest daughter. Sadly, the £250 contribution from the Government was completely stopped from January 1st 2011, and you can no longer set up a new CTF. Essentially, they were replaced with Junior ISAs. So, Junior ISAs, what do you need to know? Firstly, unlike a child’s savings account, you won’t be able to dip into this – even if you do see an adorable little snowsuit in the sale. This money is locked in until your child turns 18, and when they do, it is their money not yours! Therefore think carefully before setting one up. OK, you’re happy with the idea of not being able to get your hands on the cash, the next decision to make is what type of Junior ISA: a cash one, a stocks and shares one (often referred to as an investment ISA) or one of each? You can’t pay more than £3600 into them in a tax year (whether you have one or both types). A cash Junior ISA pays tax-free interest on the money you save. It doesn’t have the potential for significant gains like the stocks and shares ISA, but you won’t lose any money if the stocks you’re invested in take a tumble. With a stocks and shares Junior ISA your money is invested and you won’t pay tax on any capital growth or dividends you receive. I set up investment ones for my twins with OneFamily (formerly Family Investments), and due to the current stock market conditions, these have actually lost money. I’m not too worried as this is a long-term investment and I fully expect that in the next 17 years the stock market will pay some very good returns. There are many providers of both types of ISA; again comparison websites give a good snapshot and the GOV.UK website (https://www.gov.uk/junior-individual-savings-accounts) has a really useful section, which covers all the key facts. A final note: I am not a financial expert, I am talking about my own experiences, so as with anything like this DYOR! 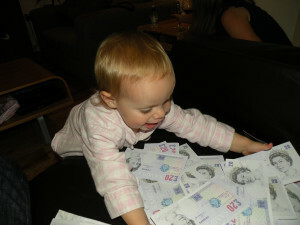 * A child can, in the 2012-13 tax year, earn up to £8,105 tax-free from salary, savings or investments.